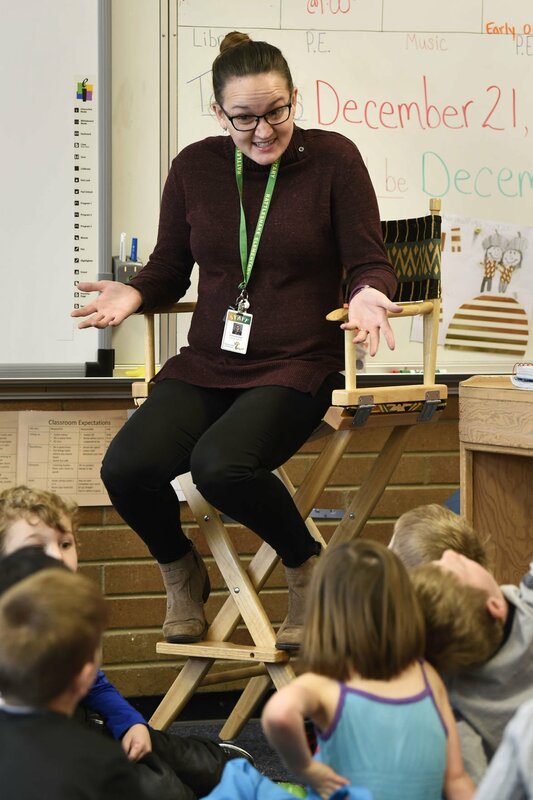 Rattlesnake Elementary first-grader Rosalie Aldrich feels teacher Braelynne Shell's belly as she talks to her students about her pregnancy the week before the holiday break. Shell is in her first year as a teacher. Shell talks to her students about their lesson on the winter solstice. Rattlesnake first-graders Sophie Squires, George Shimanek and Ruby Kline, from left, work on a class project while their teacher Braelynne Shell straightens out some of their materials before the holiday break. MISSOULA — "For 500 years, people have welcomed the solstice because it's a new beginning." That was a line from "The Shortest Day," a book that parent volunteer Nici Holt Cline read to students in Braelynne Shell's first grade class at Rattlesnake Elementary recently. And it's become a theme as everyone in the world of education looks to a new year, new leadership and new legislation that could have a lasting impact on teachers and their students. Several studies have found that up to half of new teachers leave the profession within five years. Teacher recruitment and retention are on the minds of educators nationwide, and in specific ways in Montana. Montana has the lowest average starting teacher pay in the nation and rural school districts struggle to recruit teachers to relatively isolated towns. It's a problem that came to the forefront in discussions among several statewide organizations and public agencies this year. The School Funding Interim Commission, a body of state legislators and public members, met six times to talk a wide range of education issues — but teacher recruitment and retention rose to the top. The Board of Public Education gave more flexibility to teacher licensure requirements in November. The Montana University System put together an Educator Recruitment and Retention task force. The Montana Rural Education Association launched the Rural Educator Fellows Program, a scholarship program to encourage student teaching in rural communities. A new state superintendent of public instruction was elected, Elsie Arntzen, the first Republican to take the seat in nearly three decades. Republican Donald Trump is also heading into his presidency, and he chose Betsy DeVos, an advocate for school choice and vouchers, to head the U.S. Department of Education. Teachers unions are not particularly optimistic about the upcoming legislative session. Arntzen and the MEA-MFT traded barbs during her campaign, with the union denouncing Arntzen as having an "absolutely deplorable" voting record as a state legislator. Throughout her campaign, Arntzen continually referred to the state teachers union as a "special interest group." Teachers unions are equally unnerved by DeVos' appointment. At MCPS' December school board meeting, Missoula Education Association president Melanie Charlson said the union was "not at all impressed" with DeVos. "Betsy DeVos has not had any time whatsoever in a public education facility," Charlson said. "She is a staunch supporter of charter schools and privatization." Altogether, it's a mix of changes that have some educators on edge, while others are cautiously hopeful. "Being a person who works in a public field where the government can dramatically affect your job, it's always unnerving concerning what they could do, what could change and how it would affect my job," Shell said. "I think both sides' intentions are always, I believe, to do good. No one is doing something because they think it's wrong. My hope and concern is if they're doing something they think is right, they should be doing it for the next generation." Montana's legislative session kicks off on Monday. There have been more than 100 bill drafts related to education filed so far, several of which deal directly with teachers. They include a bill draft to revise stipends for national board-certified teachers, one to revise teacher retirement laws, one to revise K-12 teacher stipend laws, one to provide additional alternative certification options for K-12 teachers, one to revise the Quality Educator Loan Assistance Program, one to establish a hybrid tier in the Teacher Retirement System for new hires, and one to revise post-secondary scholarships to address the teacher pipeline. MEA-MFT board president Eric Feaver expects a rocky road for legislation that could affect teachers. “What I think will happen and things I don’t want to happen, they kind of collide with each other,” he said. “Optimistically, the legislature will adopt school funding in its rawest form (inflationary increases required by statute). Us in the public schools community believe it’s their constitutional obligation; they have to do at least that. Teacher recruitment always comes down to salary, and in Montana, that’s often a hard sell. The starting average salary for teachers here is the lowest in the nation, according to the National Education Association, and it’s even lower in rural districts. In the Missoula area, the salary for a teacher fresh out of college runs the gamut, from $26,000 to $37,000. "As a teacher in Missoula, you can't afford to live in Missoula," said DeSmet School principal Matt Driessen. "Cost of living is tough. Housing here is incredibly expensive. So young teachers look at that and say, 'I could go to Minnesota and my starting salary is going to be $38,000 and cost of living would be the same. Data collected by the state's Educator Recruitment and Retention task force show that 72 percent of Montana University System student teachers served in urban areas last school year — while urban areas only made up 17 percent of cities that had student teacher placements. Dani Smith, Office of Field Experiences director with University of Montana’s Phyllis J. Washington College of Education and Human Sciences, said students spend much more time student teaching today than when she was in school. "There's nothing that can completely prepare you for a classroom of your own, but we prepare them as well as we can," Smith said. UM student teachers most often go to schools within a 50-mile radius, but she encourages students to "keep your mind open" when it comes to rural schools. "If you're not wed to the idea of staying here in Missoula, it can open up your opportunities so much," she said. "If we can get candidates to go out there, they want them." “Is this funding source at risk?” MCPS trustee Diane Lorenzen asked of Title IIA federal funding at the December board meeting. It’s federal funding that can be used for teacher recruitment or retention, professional development or to reduce class size. MCPS uses it for the latter, with the funding going to eight elementary and two high school positions. Montana recently submitted its plan to implement the Every Student Succeeds Act to the feds. Many wonder what may happen to ESSA — the act that replaces No Child Left Behind — with Trump and DeVos coming into office. Outgoing superintendent Denise Juneau said in an email that she hopes efforts to boost teacher recruitment and retention continue after she leaves, citing some recent successes in allowing work experience to count toward licensing requirements and adding flexibility to teacher licensure that would let teachers outside Montana more easily get their license here. Arntzen could not be reached for comment as of press time. "My hope is that Superintendent-elect Arntzen continues to develop teaching and learning tools for Montana educators," Juneau said in an email. "Over the last eight years, we’ve taken a giant leap forward in providing educators with high-quality, Montana-made professional development opportunities online and through in-person training. "As we ask more of our students and continue to raise the academic bar, it’s important we provide educators with the resources they need to support their students." Shell counts herself lucky to start her teaching career in Missoula County Public Schools, and at Rattlesnake. The school has a helpful PTA, and Shell said her colleagues are a strong support system — especially this fall when not only was she in her first year teaching, but found out she was pregnant. "Whatever happens, teachers need to feel supported and valued in the day-to-day," said Shell, who said that nationwide, that's not the case. "Even in this great school, it's not every day you feel valued. You get those negative comments, and sometimes you feel like a punching bag. "I'm better when my cup is full. You're more focused, more apt to do it, when you're not drained, bogged down or hate coming to work." This is the third of an occasional series of stories that will follow Braelynne Shell during her first year of teaching, exploring the challenges and experiences that cause up to half of new teachers to leave the classroom within five years.